San Pedro Creek at Christmas – The Frost Tower seen from the San Pedro Creek in San Antonio during Christmas time. We like the colorful art tile mural that tell the story of Pedro Creek and its history along the new boardwalk in San Antonio. This was during Christmas time and the boardwalk street lights were wrapped in colorful lights and the water had these ribbons of light changing colors along with other seasons holiday lights all along the creek. This is considered a linear park and the main focus is on the creek’s natural beauty, the rich and colorful story of its own history, the cultural identity and traditions of the community around it, while ensuring protection for a growing urban downtown. This board walk has the first phase completed there are still other sections yet to be completed. Christmas Along San Pedro Creek – The Frost Tower seen from the San Pedro Creek in San Antonio. We like the colorful art tile that tell the story of Pedro Creek and its history along boardwalk.. This was during Christmas time and the boardwalk street lights were wrapped in colorful lights and the water had these ribbons of light changing colors along with other seasons holiday lights along the creek. 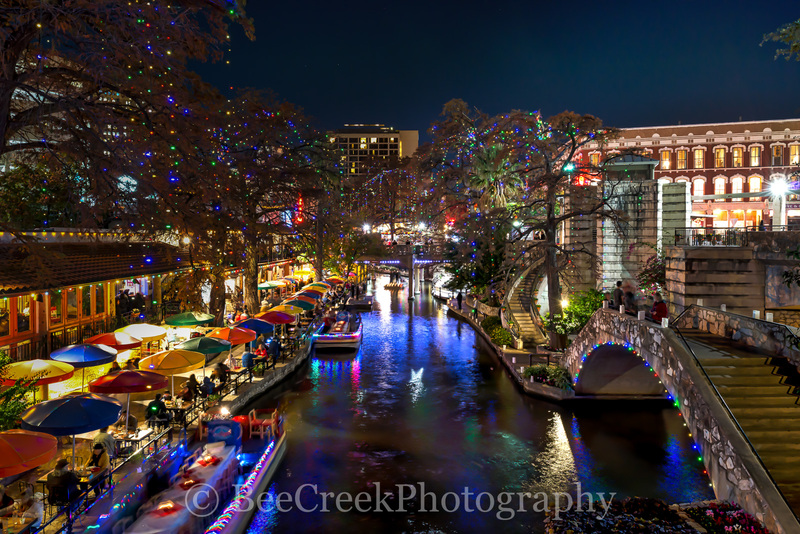 Posted in Uncategorized and tagged boardwalk, boardwalk lights, Christmas, color lights in the water, Frost Tower, holiday, holiday season, lights, linear park, reflections, San Antonio, San Pedro Creek, season, skyline, water on January 7, 2019 January 8, 2019 by Bee Creek Photo. San Antonio River Walk at Christmas – The San Antonio River Walk at Christmas image of the very festive San Antonio riverwalk with all the lights in the trees and along the path of the river. The riverboats during the Christmas season with there festive lights along the river with all the lights along the walk make for a great place to visit during the holidays.The river walk in San Antonio is always magical around the holiday with all the Christmas lights. Tourist come from all over Texas to enjoy the festive environment. Holiday on the Riverwalk – Another image of the very festive San Antonio river walk with all the lights in the trees, the riverboats with there festive lights along with all the lights along the walk it is a wonderful place to go for the holidays. Posted in Photo of the Day and tagged boats, Christmas, cityscape, cityscapes, decorations, festive, festivities, holiday, lights, river walk, Riverwalk, San Antonio, season on December 16, 2018 January 7, 2019 by Bee Creek Photo. 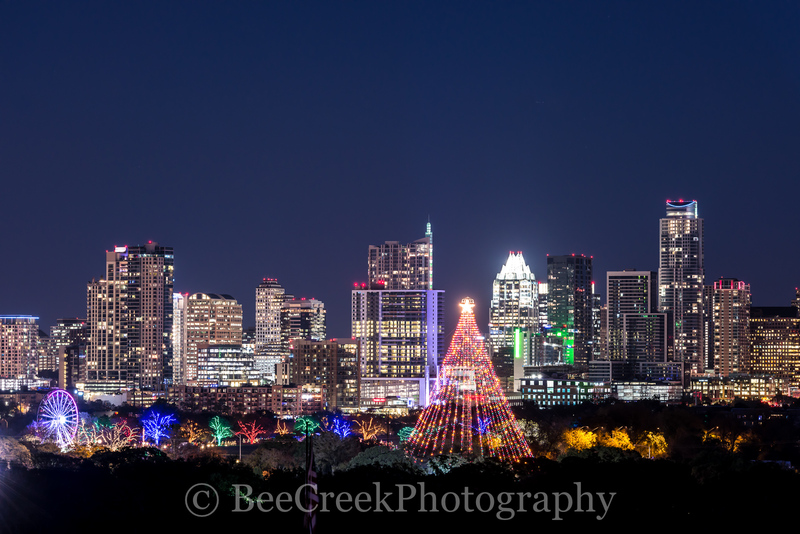 Christmas Tree Austin – Another capture of this image of the Zilker Christmas Tree with the Trail of Lights and the city skyline in the background. This is a pano in order to capture the largest part of this incredible view. Posted in Photo of the Day and tagged Austin skyline, Austin skyline trail of lights, buildings, Christmas in Austin, Christmas Tree, cityscape, cityscapes, colorful, downtown, festival, festive, high rise, holiday, moon tower, Trail of lights, Yule Fest, Zilker Christmas Tree on November 19, 2017 September 25, 2018 by Bee Creek Photo.